I knew what was coming in this months Feel Unique box before it arrived, Im a sucker for spoilers and because of the Royal Mail being a little slow at the moment I wasnt sure when it would arrive. I've seen a few comments saying they are dissapointed with this months box and its not "special" enough for christmas, Personally that doesnt bother me. I dont really have super high expectations of boxes and what might come in them! 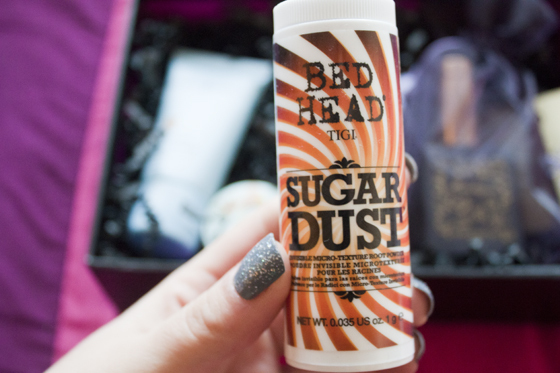 The main thing I'mintrested in is the Bed Head Sugar Dust, Alot like the OSIS+ one from a few boxes back. Its quite weird product, as the tub feels weightless like theres nothing in it! Its basically just a powder volumizer, which I really like at the moment so Im happy with that. The Clarisonic Cleanser looks alright, I actually really want a Clarisonic but I cant pluck up the courage to buy one, I keep nearly doing it then chickening out! 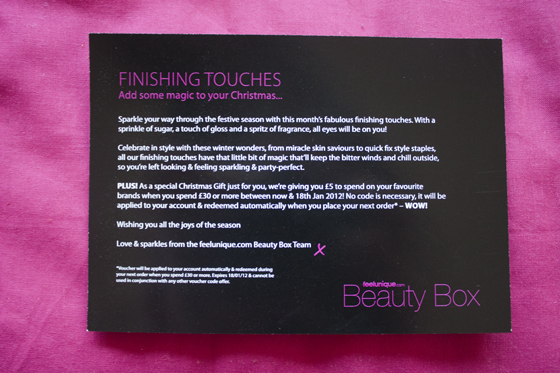 I have a full size of the Oxford Circus Nails Inc, so thats going in my stocking filler pile, as with the balm as I have a friend in mind who I know would adore it. I actually dont hate the perfume either, its 50ml and has a very woody,musky warm smell to it. 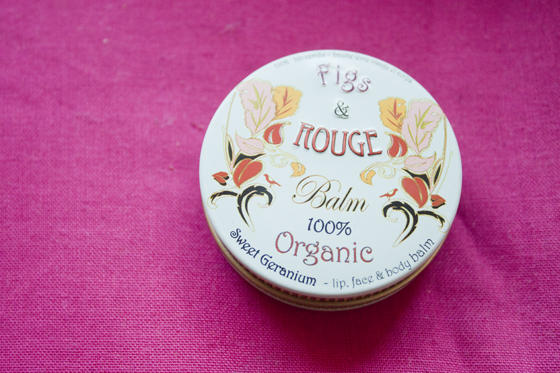 Im suprised I like it as I normally go for sweet and floral scents! The thing that I find interesting about Feel Unique is that their boxes are secondary to their business, they sell products and the Beauty Box is the addon service. I think this is why they are more reliable brand wise, as they obviously represent alot of brands to begin with, rather than having to approach brands each month to get different samples. Overall, I think the box was alright. The perfume was the surprise thing for me as I thought I'd hate it! Its Christmas so they bits I dont like are easily passed on without me having to spend extra money on things. This box looks good ! The products are really cute. 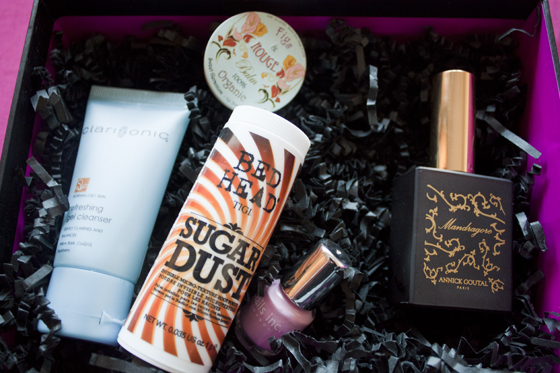 Im doing a giveaway on my blog to win this box! I thought this box was great, wish it had more of a festive feel though! I think the feel unique box looks pretty good and I'd be more inclined to go with them and trust I'd get decent things as the box is a secondary thing. 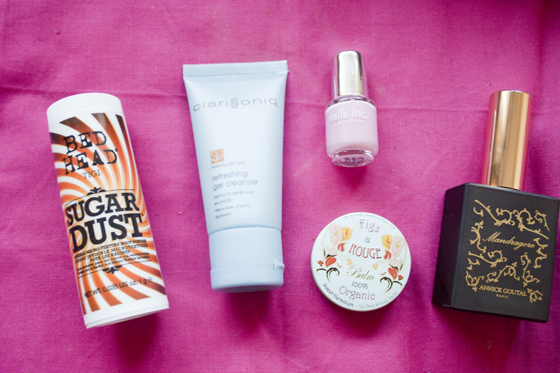 I love powder volumisers so would have been thrilled with the sugar dust! Hello! All you share with us is up to date and quite informative. I would like to bookmark the page so I can come at this time again to read you, as you have done a magnificent job. If you like games you can disfruta en friv juegos for free. Thanks admin!